Submitted by witness on Sunday, January 7, 2018. 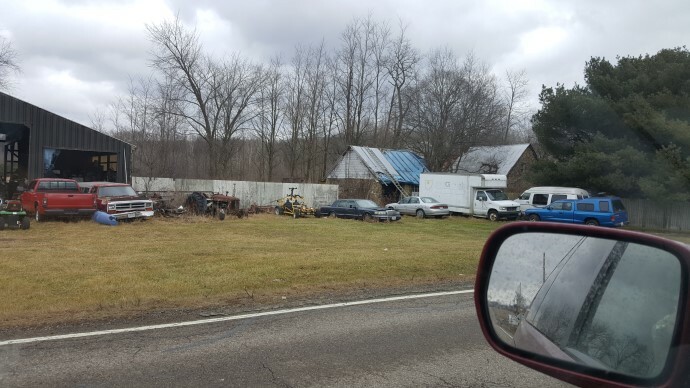 LOCATION DETAILS: Address on the nearby mailbox is XXXXX, State Route 36, Knox County Ohio. OBSERVED: Was driving to my fiancé's house with her in the car at around 6:30 PM. We were heading east bound on 36 when we both witnessed in our headlights a shadowy figure sprint across the road from north to south. When I say sprint, I mean like a 100m dash sprinter or faster. It was about 30 yards or so in front of our car with another car coming from the other direction. It was probably 20 yards from the other car. I asked her, "Did you see that?" I told her that I saw a figure run across the road and I could see its legs. She responded that she did see a shadowy figure run across the road too, but was not able to notice any more than that. It all happened so fast. I use to watch the Finding Bigfoot show a lot, so we spent the rest of the car ride asking questions, explaining observations and possibilities. The location as described below was from a lot of parked cars surrounded by trees on the north side of the road to the south side of the road along the west side of the old farm house heading towards the big fields in the back. From my perspective I was able to see the figure because of the on-coming cars headlights. It was a black shadowy human like figure. I could see 2 humanoid legs for certain and it definitely wasn't a deer or anything on all fours. It seemed to be rather tall, but I didn't see any more than legs and body. If the car coming my way had been a truck I might have seen more. I believe it made it across the road in 3 steps judging by what the first 2 steps looked like. It seemed like it was sprinting very fast. Because it was dark out and we were driving 55 MPH, in the snap of a finger it was gone. We did not stop and investigate. 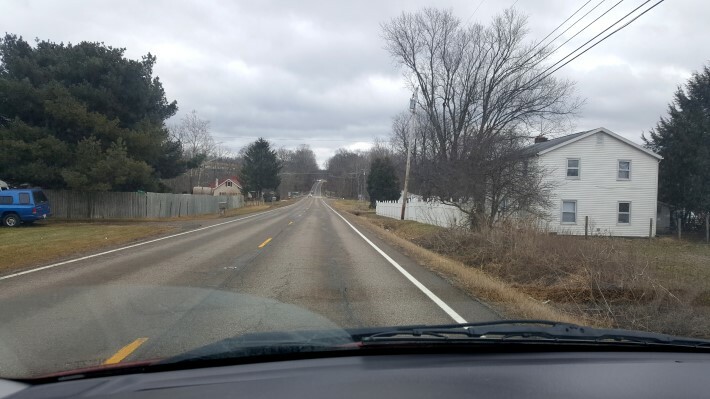 Upon driving through area the next day, I noticed a 5-6 foot ditch on the south side of the road and figured out that's why it had to be sprinting so fast so it could jump over the embankment. ALSO NOTICED: It appears to be the best spot for about a mile each way for something to move across the road during periods of heavier road traffic. OTHER WITNESSES: My fiance in the passenger seat. TIME AND CONDITIONS: About 6:30 PM and very dark. Snow on the ground that had been there for days. Cold, about 20F. ENVIRONMENT: Out in the country, lots of open land around the spot. Houses spread out along the road. A 5 foot ditch on the south side of the road. A large creek that flows into the Walhonding River. After a lengthy onsite interview with the witness with a fellow BFRO investigator present, we managed to pinpoint the exact spot of the road crossing. Its a state route with some decent traffic flow during the daytime hours. It obviously was moving very fast as it crossed the road in three steps and proceeded down the west side of a farm house towards a big field that eventually leads to some forested rolling hills. The witness noticed how long its stride was crossing the road and how long the legs were. He could only see it from the waist down. The other car did slow down and he could see them hitting their brakes in his rear view mirror after they passed by. He said the color of the legs were a very dark black. 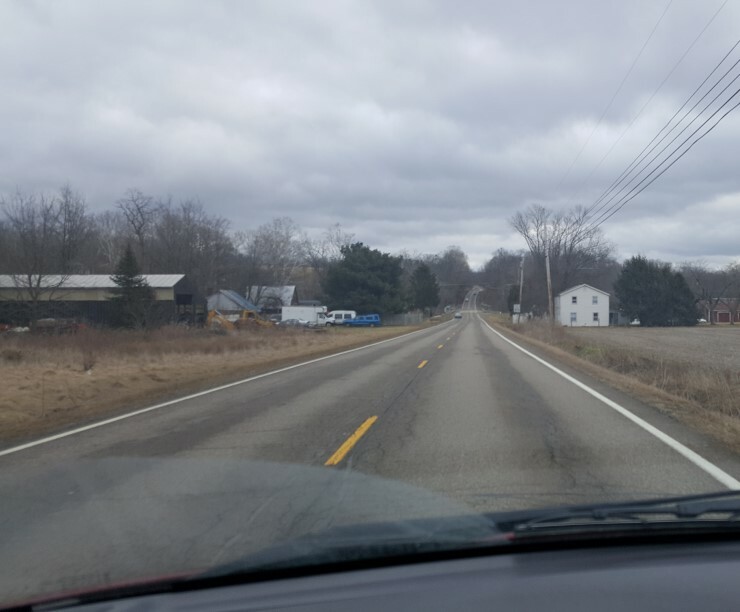 This landscape is quite typical of east central Ohio. Deer activity was noticed the day of the investigation. The witness stated that the area is flooded with deer during the evening hours.